Premium line of brake rotors that can be used for street performance, track, off-roading, towing, and hauling. 4 Different patterns to choose from. Which rotor pattern is right for you? Depending on your preference or type of driving conditions you endure, choosing the right pattern will give you the best performance. Diamond Slotted rotors remove brake and road debris and prevent pad glazing, extending the life of the pad and the rotor. The diamond tipped ends provide an indicator for rotor replacement. When the tips are gone, rotor replacement is necessary. Cross-Drilled and Diamond Slotted rotors provide the maximum benefits in stopping power, durability and performance. OEM replacement rotors are not drilled or slotted, but offer equal quality as your OEM rotors but at an affordable price. Please be advised that when you first receive the rotors, they are completely covered with the GEOMET® coating. 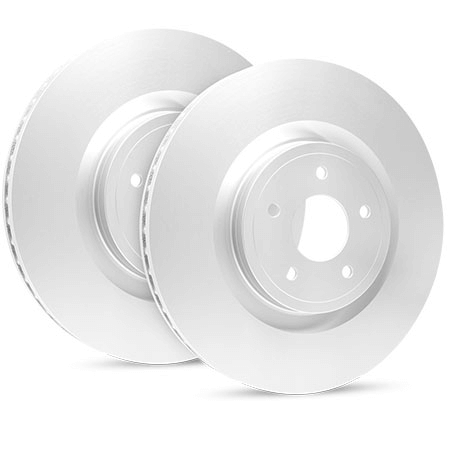 During the initial embedding process, the GEOMET® coating on the braking surface, the area where the pads come in contact with the rotors will wear off, leaving only the hub an inner vane structure coated. Add brake pads to your R1 Carbon GEOMET® brake rotors and make it a complete brake kit. Get the best in performance and value all in one box! Depending on your needs, you can order front kits, rear kits, or both. R1 Carbon GEOMET® brake rotors can be paired with any of our R1 brake pads. If you don't know which pad to choose just select our recommended selection. Our recommended selection is for each vehicle type, offering the best performance, and the lowest noise. Ready to be installed right of the box with no modifications required. Designed and produced to have the same form, fit, and function as the original equipment part enabling easy installation and ensuring proper fit. Reduces noise/vibration and premature wear. Recommended replacement with every brake pad change. What conditions are these items in? All our items are 100% brand new. Will call is available to all Southern California residents. Please give us a call at 1-888-R1Concepts to schedule a pickup. Will these products require additional modifications or new brake calipers? These items are Original Equipment specifications and will NOT require any type of additional modifications. However, we do recommend the use of new brake pads. We will email you a tracking number when all items are shipped. 365 days warranty (1-year). We will replace your brake rotors after inspection for any warping or manufactured defects. Buyers are responsible for all returns; shipping, duties and/or custom fee. Warranty will not be granted if any signs of abuse or if the rotor(s) has reach it's minimum thickness. And cannot be transferred to new owner or to different parts. Disclaimer of Warranty: By purchasing parts, purchasers expressly acknowledge, understand and agree that they take, select & purchase any part from R1 Concepts and its affiliates, distributors, and agents "As is" and "With all faults." The entire risk as to the quality and performance of any parts is with the purchasers. Should the parts prove defective following the purchase, purchase assume the entire cost for all necessary servicing, repair, replacement of any resulting liability, R1 Concepts makes no warranties whatsoever, express or implied, oral or written, to purchasers or any user of these parts. R1 Concepts express disclaims any implied warranty of merchantability or fitness for a particular purpose, including fitness of any parts of racing. We offer 60 days return policy starting the day buyer receives the item(s). Item(s) being returned must be in brand new condition as it originally came with the original boxes, hardware, manuals, accessories, and etc. All shipping expenses including duty and/or custom feeds will be paid by the buyer. A 15% restocking fee will be charged. Why buy new brake rotors instead of turning them? Which rotor is considered Left or Right side? What is brake pad bed-in? Is there a Dust-Free pad? Solid or Vented? How can I tell the difference? What is a Diamond Slot Rotor and why it is superior?